Myrmixians are an ant-like bipedal species with four arms. As indicated by their ability to make and use tools, they do display signs of sentience and intelligence, but both are quite alien to humans. Technically speaking, they are Lawful creatures; however, their idea of 'civilization' tends to be in conflict with both Lawful and Chaotic creatures. Thus, they are listed as having a Neutral alignment. 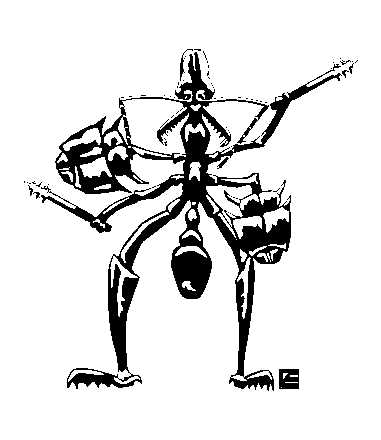 In combat, Myrmixian soldiers wield two shields made out of the heads of giant ants. They are quite adept at using both at the same time and improve their base AC of 2 to an AC of 0 when thus armored. Each shield may be sacrificed to negate a single hit against them (for a total of two hits). In addition, each shield is armed with a stinger filled with a paralytic poison excreted from Myrmixian pupa. A successful attack with the stinger also destroys the shield. Those who make a successful save vs. poison will still suffer a -2 to all rolls. The effects of the poison (whether full paralysis or the -2 penalty) will wear off after 1d6 turns. Myrmixians come in a variety of colors, but recognize each other by scent. Thus, in a conflict between Myrmixian hives, it can be very difficult for non-Myrmixians to distinguish sides. All Myrmixian hives will also be inhabited by Giant Ants which have been domesticated for a variety of tasks around the hive. These Giant Ants will have double the chance of mining precious metals. Due to their alien intelligence, Myrmixians place value on a variety of strange things. Their Hoard Class reflects this reality — random bits of valuables scattered among what they consider to be "treasure." Feel free to have fun with this. Yesterday, James over at Grognardia did a piece on August Derleth and his (albiet small) contribution to the heroic aspects of the Call of Cthulu RPG. Yesterday was also the Feast of St. George the Great Martyr. These two seemingly unrelated topics are deeply connected in my mind and in the way I understand and play RPGs. Of all the authors listed in Appendix N that we old timers like to point to as our inspiration, HPL looms very large in my own formation as a person and as a player. The images he uses to describe the nothingness that looms in the dark just beyond our awareness and the words he gives our fears about these lurking dooms are not only hauntingly beautiful, but empowering. We live in a fallen world filled with decay, disease and death. We are all doomed to die. We can live in denial and try desperately to ignore our own mortality only to find ourselves getting closer to our inevitable end every day, despite our best efforts at holding on to our youth. Death is alway crouched just over our shoulder, ready to strike at a moment's notice. To live in this shadow is terrifying. HPL names this fear and gives it form. Thus, though we are in the midst of fighting the long defeat our own life, HPL allows us to come face to face with that defeat and march forward in spite of it. St. George was a Roman soldier from Cappadocia in modern day Turkey. He proved to be a charismatic leader and quickly rose in rank. By his twenties he was a tribunus and later became a comes. Eventually, he was stationed in Nicomedia as a member of the personal guard attached to Emperor Diocletian. In 303, the Emperor issued an edict authorizing the systematic persecution of Christians throughout the Empire. St. George faced his own end and he bravely walked through it. Instead of participating in the persecution of his own people, he confessed to be a Christian and openly criticized the imperial desicion. Diocletion ordered his torture and execution. He was eventally beheaded in front of the defensive wall of Nicomedia on Apri 23, 303. St. George looked at the creeping doom described so evocatively by HPL and did not flinch. He chose to do the right thing — the heroic thing — despite his full knowledge that he would not do so without suffering and dying. Of course, from a Christian perspective, death no longer has any sting because Christ has risen from the dead, trampling death by death and to those in the tombs he has granted life. That belief, however, still requires a tremendous amount of faith and courage in the face of certain toture and death. St. George had that faith and that courage and he stood up in front of the looming darkness in an effort to stop it. In the short term, he failed. Emperor Diocletian, and Galerius after him, systematically sought out and killed Christians throughout the Empire for eight long years. The Synaxarion of the Church is littered with martyrs from this era. In the long run, however, St. George's faith, courage and sacrifice changed lives. Diocletian's own wife became a Christian as a result. She stood in the breach and gave her life as well. Others followed day after day fightng the long defeat. Except that in the larger Christian world-view, though our own battles will end in defeat, the war belongs to Christ, and He will be victorious. In 311, Galerius gave up on his quest to purge the Empire of Christianity and issed an edict of toleration. When St. Constantine became the first Christian Emperor in 313 initiating a Christian empire that would last a thousand years, Christianity, through the martyrs like St. George, conquered the known world without lifting a sword. Armed against the slithering darkness with only the words, "I am a Christian," St. George succeeded where the Gauls, the Dacians, the Greeks, the Persians, the Egyptians and countless others failed. Though we die, we fight the darkness with good cause knowning that our King will come again and grant us citizenship in the New Kingdom where Cthulu, Yog Sothoth and the Elder Gods will be no more. Thus, I love to play the low level characters who are up against seemingly unconquerable evil and leap into the breach though it may very well be their end. I do it, because in a small way I can emulate St. George knowing that though I suffer this tiny defeat, I make it possible for the next character/generation to have that faith and courage to do the same. Recently (inspired by Dyson at A Character for Every Game), I've been experimenting with geomorphs. I remember seeing them in my hobby store as a kid, but never bought them nor ever used them in all the years that I've played RPGs. Until now, I've never had much use for them. 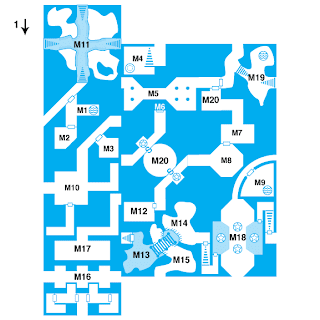 It wasn't until I embraced the model of building dungeons expressed by Moldvay and modeled in B1 In Search of the Unknown that I have grown to have any appreciation for them. 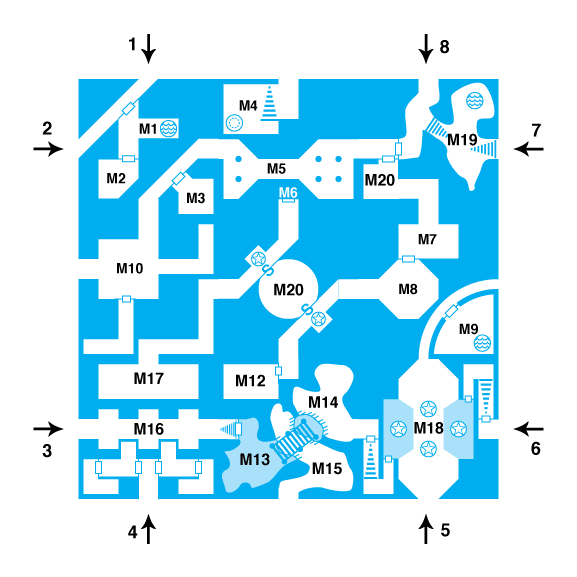 For those who do not fully embrace the Moldvay/B1 style, I do have a wonderfully nasty way to use them as a large encounter area to be dropped into your favorite megadungeon or even as a stand alone adventure. In an homage to the Greek myth, I call it the Maze of the Minotaur. The maze will periodically shift of its own accord. Whenever a wondering monster encounter is indicated, the maze shifts. When the adventurers are on the geomorph that gets pushed off the map there are two possible ways of handling this. The first is to keep them on the ousted geomorph, with all exits off the section blocked by rock/steel/some kind of magic force. The adventurers will have to wait for the maze to move on its own. The other possibility is to teleport them onto the geomorph that just replaced the one pushed off the map. If anyone happens to use this concept in play, I'd like to hear how it goes. One of the risks that you run as a Referee when undertaking a sandbox campaign is that the work put into creating dungeons can go for naught if players interests take them elsewhere. Personally, I deflect much of this by copius use of random tables — they severly cut down on prep time and not only offer up an interesting concoction for my players, but challenge me as a Referee which makes things interesting for me. One of the curiosities of this campaign has been the way my group has largely ignored the tent-pole megadungeon (as James over ar Grognardia likes to call them). Although the campaign started out with several forays into the megadungeon, they have gone out of their way to avoid it ever since they delved too deep and ran into some things beyond their capabilities. This has resulted in making the place even more dangerous (sans an adventuring party to keep the forces of Chaos in check, they have slowly been able to accomplish their goals and grow in power). 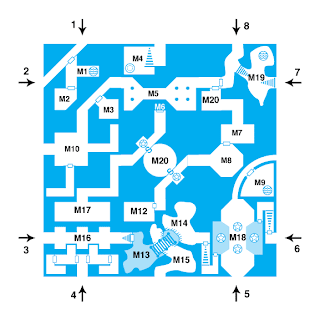 Instead, this campaign has largely been outdoor exploration with the occasional dungeon delve when lairs are found. I find myself asking whether or not the megadungeon concept is at fault, that this group (having largely learned the game with 3.5) just isn't used to the idea, or if my version of a megadungeon just doesn't hold together very well. This session I got burned a little bit. Ever since the party left Xerxes, the NPC Magic User, behind when they travelled to Trisagia, I have been planning a betrayal, a theft, a murder and a fun house dungeon. Upon returning to Headwaters, the party found out that Fr. Taggert had been murdered, the Golden Mask being kept at the Church had been stolen and the Eye of St. Gabriel had been gouged out of Fr. Taggerts' eye socket. The prime suspect is Xerxes, since he hasn't been seen since the murder and thefts. The party went to his room at the inn to investigate, only to be welcomed by a taunting magic mouth informing them that if they wished to get the Eye back, they would need to follow a map buried under the corner stone of Hamlen's father's barn (which happened to lead to a good 'ol fun house dungeon I've been piecing together for several weeks). However, the party decided to go (yet again) in an unexpected direction. Earlier, they had encountered what they thought to be a dragon (which had killed one of the PCs). In its possession was a vial of a silvery liquid they needed in order to give Grak an artificial arm. Thus, instead of puzzling through my fun house, the party decided to take on a dragon and forced me to take out a map I'd drawn a couple months ago which at that time was ignored. What ensued was a brilliant use of a Shrinking Potion and a Bag of Holding. Unbeknownst to the party (and to their great benefit) the said "dragon" isn't a real dragon, only dragon-kin. It has no breath weapon, though it is poisonous and regenerates like a troll. After getting its attention by massacring a number of its goblin minions in an ambush, the dragon killed the party's horses and dogs and then proceeded to roll horribly and get itself "killed" (by the Halfling, no less); however, the regeration meant that the party could not kill the dragon with conventional weapons. Thus, when they had knocked the dragon out, they forced a shrinking potion down its throat, tied him up and threw him inside a bag of holding. I was stunned. I thought the move so brilliantly cool, that I allowed the maneuver. Now the party has a dragon stuck inside a bag of holding with no way out (the potion has since worn off and it can't fit through the small opening of the bag) and it is starving. It will be very interesting to see what the party manages to do with it. As an aside, I was pleasantly surprised by one of my players (Arkmed the Dwarf) who thanked me for running Labyrinth Lord. He confessed that he liked the system better than 3.5 — it was quicker, freer and allowed the party to accomplish a lot more in a shorter ammount of time. It seems that you don't have to be a grumpy old man who's played since the 70s to appreciate the old ways. Thank God. Over the weekend, James over at Grognardia wrote a meditation on the Referee as a player. An integral part of this is the use of the random die roll for such things as encounters, treasures, wondering monsters, reactions, etc. because it allows for the Referee to be surprised. As I've recently admitted, the Lost Colonies campaign depends far more on random rolls and ad hoc decisions than it does on any kind of pre-planned plot or narrative. There is an overall background "theme" that evolves over time, especially as it reacts to the actions of the player characters, but it doesn't dominate the campaign, unless the players make choices to allow it to. For example, this session was almost entirely the result of a random die roll. The players surprised me somewhat this week. After discussing their options, they decided that Headwaters had a larger claim on their interest than the portal they found beneath Trisagia (aka the City). Thus, they equipped themselves for the 10 day journey. I was actually kind of pleased by this turn of events, because the decision is the result of the players putting down roots in the small town. For example, Hamlen has made plans to build a tavern (and has even made his first hire — he offered a better life to the one-armed prostitute he garnered information from when they first arrived in Trisagia). On they way back, I rolled a random encounter and came up with a werewolf along with some wolves. The party then used their newly purchased war dogs to track down the lycanthrope's lair. I pulled out a map of a "haunted house" that had a nice surreal and creepy ambiance. None of the encounters were necessarily dangerous, but it did allow for the rest of the werewolves to show up as the players were exploring the house in a kind of grand entrance. During their investigations, they found several knicknacks — including some highly explosive "oil" — as well as the main treasure trove hidden inside a bag of holding. The highlight of the evening was an encounter with a mummified head. In an ad hoc decision, I gave the thing the ability to talk. It claimed to have a vast amount of knowledge, but would only divulge such information if a favor was granted. Although the party was greatly tempted, they refused — given the creepy environment. All of this was virtually made up on the spot, using a combination of my library of maps and adventures, die rolls and my own creativity. This is fairly typical. As such, I rarely place items in order to solve a problem later on in an adventure. Yet, my players often think that I do. As a result, they assumed that the explosive oil was for the purpose of ridding the world of the talking and mummified head. So, they proceeded to have a "Mythbusters" moment and blew the whole house to kingdom come. We all had a lot of fun with it. I realize that several old-school modules from back in the day placed treasures that help parties later in the module to survive one or more encounters (a silver weapon for lycanthropes, potions of water breathing to deal with an underwater encounter, etc. ); however, I wonder how much more evident this practice became in later editions of the game. In other words, is this assumption by my players that I place items to solve situations later in the adventure typical in every era of the game, or is it more prevalent in the narrative "story telling" adventures of later editions? I should first explain that life has intruded quite a bit in the last month or so, which explains why I have not posted much. Lent, Holy Week and health issues have all been much more challenging than expected. Hopefully, life will settle down in the coming weeks and you will see more posts (for example, I have two more sessions of Lost Colonies to write...). The beginning of this session involved finishing up the last of the puzzles I pulled out last time. It is one that I am particularly fond of and so I will share. As I mentioned last time, the room was covered in mosaics. On the far wall were three queens holding a chest. On the left wall, the three queens were dressed and ready for battle. On the right, two queens were standing, the third was sitting and all wore black. At the far end of the room were three life sized statues of queens armed with swords floating a couple of inched off the floor. In mosaic on the floor was a 6x6 checker board. The puzzle is solved (thus opening the chest) when the three queens are placed upon the checker board in such a way that every square is attacked according to the rules of chess. If the three queens are placed upon the board (and they are easily moved, gliding across the floor) in such a way that any spaces are not attacked by the queens, not only do the queens return to their original position in the room, but some kind of undead creature appears in each of the spaces not attacked by the queens and immediately go after the party. Due to a lack of explicit directions, this room resulted in a lot of trial and error by the players and proved to be a bit more combat heavy than I expected, but was entertaining, none-the-less. When every player is pouring over possible solutions and sharing ideas, I figure a puzzle has done its job. After the players solved each puzzle, the "chest" in the wall was opened revealing a bit of treasure and a rod engraved with writing similar to that on the Golden Masks they have been periodically running into. In addition, each was topped with a different 3D shape (pyramid, sphere and cube). Three significant finds happened to be in the chest protected by the queens: a tunic covered with Istenite iconography, a phylactery and a short sword engraved with the elven word for "hornet." 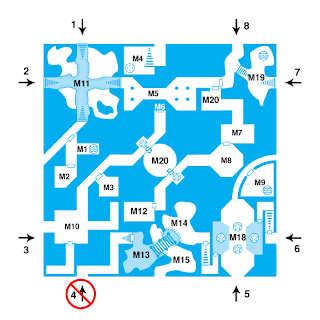 There was now only one part of the dungeon that the players had not been able to explore, due to setting off a trap that resulted in a lingering, acidic cloud. After solving all the puzzles, they returned to the site of the trap and found out that the cloud had dissipated. Beyond, they found a room occupied by some kind of fleshy construct covered in runes. When the characters considered attacking it, these runes appeared on parts of their bodies. The construct, however, did nothing until the party finally did make an attack (a Hold Person spell which failed to have any effect). What followed was a bit of a surreal combat. As Hamlen again stood in the breach armed with Liberator and boosted by Bless and Cure Light Wound spells, Arkmed the Dwarf was busily trying various key combinations in a dias in the room beyond the construct. As Hamlen found out that he shared any damage he did to the construct, Arkmed found that each key combination transformed the entire room into a portal to various unknown locations: a desert, a snow bound valley, an underwater city, an underground fungal forest, an unlit cavern and a featureless hallway marked only by circular iron door. When the construct was finally defeated, Hamlen was near death and the party was loathe to risk walking through to any of the unknown locations. Thus, they returned to the surface. The session ended with a report of their success to Bishop Iova. Of note, Bishop Iova informed the party that the tunic they found is a bit of a relic. It was worn by St. Siors and bestows its wearer with an extra hit point per hit die and a bless spell usable once per day.